Art Southampton joins a vibrate scene of new gallery openings and art benefits this weekend on the East End. Taken together, art receptions and cultural events could easily fill the days and nights. Following is this weekend's list of Exhibition Receptions and art events plus a selection of cultural happenings on the East End. ARC FINE ART - “Bunnies, Butterflies, and Birds” by Hunt Slonem has an Opening Reception on Friday from 5 - 8 p.m. A book signing by Hunt Slonem coincides with the opening for a new monograph "Bunnies" published by Glitterati. The exhibition remains on view through August 4. The show includes 18 new oil paintings. ARC Fine Art is located at 303 Main Street, Amagansett, NY 11930. www.arcfineartllc.com. "Untitled" by Hunt Solem, 2014. Oil on canvas, 40 x 60 inches. Courtesy ARC Fine Art LLC. CRAZY MONKEY GALLERY - "Barbara Bilotta, Richard Mothers and Mark E. Zimmerman" have an Opening Reception on Saturday from 5 - 7 p.m. The exhibition remains on view through August 11. The Crazy Monkey Gallery is located at 136 Main Street, Amagansett, NY 11930. www.thecrazymonkeygallery.com. ART SOUTHAMPTON - Two VIP Previews take place tonight (Thursday) for invitees and media. The art fair opens to the public on Friday and continues through Monday at Southampton Elks Lounge, 605 County Road 39, Southampton, NY 11968. www.art-southampton.com. RELATED: "Another Primer: Art Southampton Arrives for Its Third Edition" by Pat Rogers. RUSH PHILANTHROPIC ARTS FOUNDATION at FAIRVIEW FARMS – “15th Annual Art For Life Gala” takes place on Saturday with cocktails at 6 p.m. and dinner at 7 p.m. at Fairview Farms in Bridgehampton, NY. The event benefits the Rush Philanthropic Arts Foundation’s mission to provide art education opportunities for youths and exhibition opportunities to emerging artists. Individual tickets are $1,500 and tables begin at $15,000. Fairview Farm is located at 69 Horsemill Lane, Bridgehampton, NY 11932. www.rushphilanthropic.org/artforlife. ALEX FERRONE PHOTOGRAPHY GALLERY - “Pond Studies Exhibit and Benefit: Works By Nijole Kudirka and Katherine Liepe-Levinson” has an Opening Reception on Saturday from 6 - 8 p.m. The exhibition remains on view through Aug. 31. A portion of sales proceeds will benefit the Cornell Cooperative Extension of Suffolk County Marine Program. Alex Ferrone Photography Gallery is located at 25425 Main Road, Cutchogue, NY 11935. www.alexferrone.com. "Terrapin in Bloom" by Katherine Liepe-Levinson. ASHAWAGH HALL - “Arts Against Addiction” Fundraiser takes place this evening (Thursday). Tickets are $32 and can be purchased at the door (if available) or online at www.qtherapy.tix.com. Proceeds benefit treatment scholarships for patients of QTherapy Institute, an online counseling center. www.qtherapy.co/about-us. RELATED: “‘Arts Against Addiction’ Fundraiser at Ashawagh hall”. “Natural Elements” has an Opening Reception on Saturday from 5 - 8 p.m. Exhibiting artists include Barbara Groot, Rosario Varela, Mary Laspia, Kirsten Benfield, Susan Burr Carlo, Judy Clifford, Anne Holton, Richard Udice, Katherine D. Crone, Annie Sessler, and Lisa Weston. The show is curated by Mary Laspia. Ashawagh Hall is located at 780 Springs Fireplace Rd, Springs, NY 11937. www.ashawagh-hall.org. RELATED: “Leading LI Artists Interpret Nature in ‘Natural Elements’ at Ashawagh Hall”. 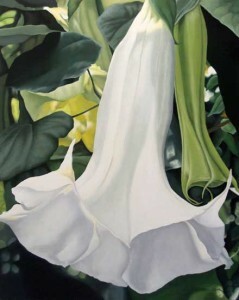 "Trumpet Flower" by Susan Burr Carlo. Oil on canvas, 3 x 4 inches. GREY AREA at GLENN HOROWITZ BOOKSELLER - “Group Art & Design Presentation” has an Opening Reception on Friday. Remains on view through August 3. Includes art by Hannah Eshel and Tom Slaughter, curated by Patrick Parrish, plus Project 8, a design and object presentation. Glenn Horowitz Bookseller is located at 87 Newtown Lane, East Hampton, NY 11937. www.glennhorowitz.com. GUILD HALL - “Talk and Book Signing with Artist Billy Rayner” takes place on Saturday from 4 - 6 p.m. Rayner will give a talk on his two-volume work, Notes and Sketches: Travel Journalism of William P. Rayner. Admission is free. “Foundation for Art and Preservation in Embassies (FAPE) Panel Discussion - Andy Warhol: Global Phenomenon” takes place on Sunday at 11 a.m. The talk is Moderated by FAPE Board Member Bob Colacello with panelists Peter Brant, Jane Holzer, Alberto Mugrabi and Aby Rosen. Admission is free. The talk is the final event for the exhibition, which closes on Sunday. Guild Hall is located at 158 Main Street East Hampton, NY 11937. www.guildhall.org. LAWRENCE FINE ART - “Crash One: Broken Language” has an Opening Reception on Saturday from 5 - 8 p.m. Crash was a subway “writer” that transitioned to canvas, causing the growth of Street Art as a recognized art form. Lawrence Fine Art is located at 37 Newtown Lane, East Hampton, NY 11937. www.lawrence-fine-arts.com. THE FIREPLACE PROJECT - “CONTACT” by Alisa Baremboym and Gregory Edwards has an Opening Reception on Friday from 6 - 8 p.m. The exhibition remains on view through August 18. The Fireplace Project is located at 851 Springs Fireplace Road, Springs, NY 11937. www.thefireplaceproject.com. MAUREEN’S HAVEN- “Maureen’s Haven Lobster Bash: Disco Style” takes place this evening (Thursday) from 6 to 10 p.m. at Docker’s Waterside in East Quogue, NY. The event benefits Maureen’s Haven, a Homeless Outreach non-profit organization serving the East End. Docker’s Waterside is located at 92 Dune Road, East Quogue, NY 11942. www.maureenshaven.org. GREENPORT HARBOR BREWING COMPANY – “Sanctuary” by Danielle Malmet Rodger has an Opening Reception this evening (Thursday). The exhibition remains on view through September 1. Rodger will show new works on canvas.The Greenport Harbor Brewing Company is located at 234 Carpenter street, Greenport, NY 11944. www.harborbrewing.com. "Sunday" by Danielle Malmet Rodger. Oil on canvas. “Barbershop” by Kadir Nelson, 50 x 50 inches. SHELTER ISLAND HISTORICAL SOCIETY - “Roz Dimon: Artifacts II” has an Opening Reception on Saturday from 4 - 7 p.m. The exhibition remains on view through July 29. The Shelter Island Historical Society is located at 16 South Ferry Road, Shelter Island, NY 11964. www.petermarcelleproject.com. "SAFETY LOST" by Roz Dimon. Digital Drawing. PETER MARCELLE PROJECT - “The Hilton Brothers: Christopher Makos + Paul Solberg” has an Opening Reception on Saturday from 6 - 8 p.m. The exhibition remains on view through August 5. Peter Marcelle Project is located at 4 N. Main Street, Southampton, NY 11968. www.petermarcelleproject.com. SOUTHAMPTON ARTS CENTER - “TALKS@SOUTHAMPTONARTSCENTER: Authentication in Art Panel” takes place today (Thursday) at 1:30 p.m. The talk centers around the current state of artwork authentication. Admission is free. SOUTHAMPTON ARTS CENTER - “Jonathan Cramer: Drawing, Sculpture, Painting” has an Opening Reception on Friday from 6 - 10 p.m. The exhibition remains on view through August 17. Southampton Arts Center is located at 25 Jobs Lane, Southampton, NY 11968. www.southamptoncenter.org. SOUTHAMPTON CULTURAL CENTER - LEVITAS CENTER FOR THE ARTS: “Tactility” has an Opening Reception this evening (Thursday) from 5 to 7 p.m. at the Levitas Center for the Arts. The exhibition remains on view through August 16. Artists on view include Darlene Charneco, Carol Hunt, Dennis Leri, and Will Ryan. The Southampton Cultural Center is located at 25 Pond Lane, Southampton Village, NY 11968. www.southamptonculturalcenter.org. RELATED: “Exhibition Listing: ‘Tactility’ at the Southampton Cultural Center”. GALLERY 125 - “Mark Van Wagner” has an Artist Reception on Friday from 6 - 8 p.m. for a Artist Spotlight event. Wagner creates abstractions using sand as his medium. Gallery 125 is located at 688 G Montauk Hwy, Water Mill, NY 11976. www.gallery125.org. "Untitled" by Mark Van Wagner, 2014. Sand and acrylic on canvas, 30 x 24 inches. “Jazz en Plein Air: Iris Ornig” takes place on Friday from 6 - 8 p.m. The bassist and composer celebrates the release of her new album, No Restrictions, at the concert. The event is free with museum admission. “April Gornik Book Signing” takes place on Saturday at 11 a.m. The artist will be signing her book, April Gornik: Drawings. Admission is $10, free for members, children, and students. RELATED: “Within a Forest Dark, April Gornik Explores Through A New Book of Drawings” by Annette Hinkle. “William Glackens" and Platform: Maya Lin” have a Members’ Reception on Saturday from 5 - 8 p.m. Both exhibitions remain on view through Oct. 13. RELATED: “Maya Lin Exhibition Opens at The Parrish” and “Glackens Survey Arrives at the Parrish”. WATERMILL CENTER – “One Thousand Nights and One Night: Sleepless Nights of Sheheragade” Summer Benefit takes place on Saturday starting at 6 p.m. The dinner is sold out but tickets remain for the cocktail hour. The benefit includes art installations, performance art, a silent auction. Dinner includes a live auction and dancing. The event honors Shaikha Paula Al-Sabah. Proceeds benefit the Watermill Center’s Artist Residency Programs. The Watermill Center is located at 39 Watermill Towd Road, Water Mill, New York 11976. www.watermillcenter.org/benefit. To See Scenes from last year’s benefit, click “ART SEEN: Performance Art Dominates the Watermill Center Benefit“. To check out the benefits happening this weekend and throughout July, click here. BASIC FACTS: The Art Round Up, a listing of exhibition receptions and art events, is published weekly at HamptonsArtHub.com. Great roundup! Please note though that although the names are very similar, Southampton Arts Center and Southampton Cultural Center are two different venues. Southampton Cultural Center (www.southamptonculturalcenter.org) is at 25 Pond Lane, where “Tactilities,” curated by Arlene Bujese, is on view. Southampton Arts Center (www.southamptoncenter.org) is at 25 Jobs Lane, the former site of the Parrish, and is showing work by Jonathan Cramer with an opening reception 7/25.